I can't help it, that is one of the things I embrace this time of year. Autumn means there will be cooler days when I can bake. Anything with butter and cinnamon comes to mind. 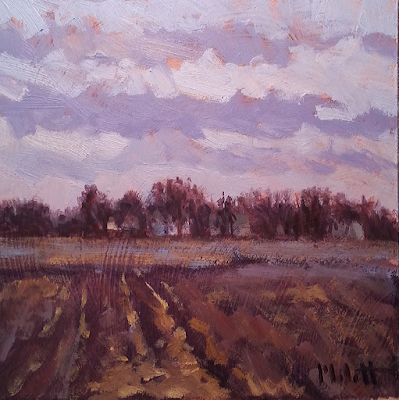 This field at dawn with the warm earthy tones and cool violet clouds of dawn give me promise of a new day. Sidenote: can you tell this is where the pheasant run from yesterday's painting?